Axial is pleased to announce VANQUISH PRODUCTS as a returning sponsor for AXIALFEST 2017! VANQUISH PRODUCTS is one of the longest standing supporters of AXIALFEST, since 2012. Even before AXIALFEST with our AWCC events as far back as 2008! Vanquish Products, home the finest RC crawler and RC scaler parts and accessories. Our products are all designed, manufactured, packaged, and shipped all under one roof at our factory in Sacramento, California. Our product line includes aftermarket parts for Axial based crawlers and scale trucks that we have a desire to raise the performance bar on. 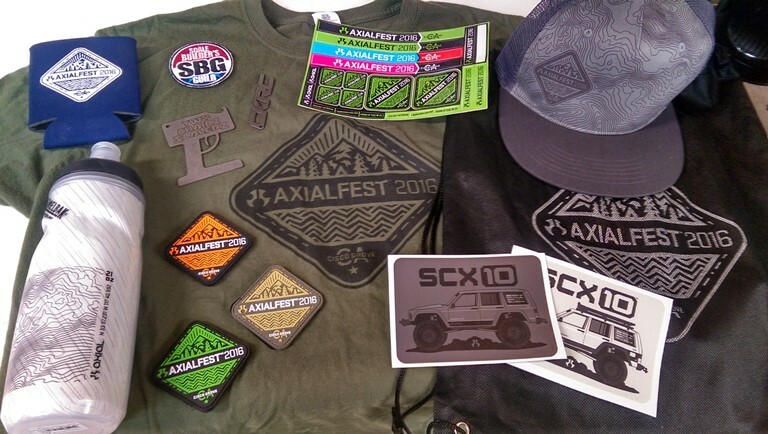 AXIALFEST2017 is fast approaching and PRE-REG is CLOSING SOON AS WELL! We have this weekend and next weekend to get Pre-Reg’ed as it will close on Monday June 7th at 9:00am!!! Why is this such a big deal? DRIVERS BAGS! You want to get the drivers bag as it comes with some cool stuff like the commemorative T-SHIRT, THE HAT and the WATER BOTTLE! Can you guess what color the water bottle is going to be this year?!?!?! Check out this video we re-edited from Josh at ESP as he dumped the contents of his bag from last year. Axial RC Inc. is proud to announce Canyon Coolers as a first-time sponsor and attendees, supporting AXIALFEST2017! 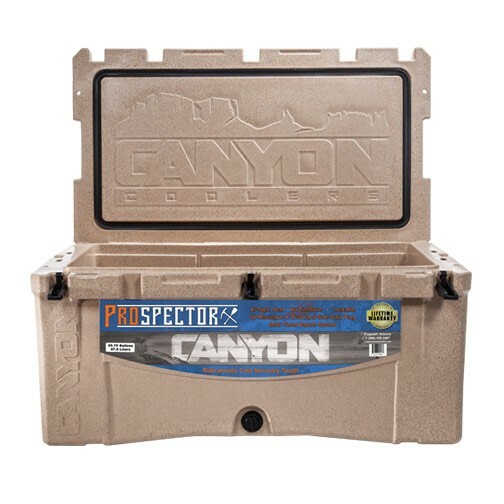 With their Prospector Series, what better fit could we find for this years Prospector Fever theme!!! Rafting the Grand Canyon’s 225 miles takes weeks to complete. Keeping supplies on ice in 100 degree temperatures for that length of time was nearly impossible with commercially available coolers. Rafting companies experimented with fiberglass containers and later started using the durable kayak plastic making crude double walled boxes and insulating them with expanding foam. Although rudimentary, the thick walled heavy duty coolers could hold up to the elements and were referred to as “Canyon Boxes”. In 2010 two local rafting enthusiasts in Flagstaff, Arizona acquired and re-branded what is today known as Canyon Coolers. Rafters were soon enjoying cold beverages throughout 27 day trips. Since then, they have developed enhanced seals, latches, and other innovations, while maintaining the heavy duty durability and insulating capabilities that started it all. New sizing and color options coupled with an easy to use website are making ridiculously tough, seriously cold coolers at a reasonable price available to everyone. Today Canyon Coolers are being utilized nationwide by a loyal following of hunters, rafters, outdoorsmen, and a major Southern California university hospital’s blood donor center. Axial RC Inc. is proud to announce PRO-LINE RACING as a returning official sponsor for AXIALFEST 2017! Axial RC Inc. is proud to announce KLP HOBBY as a first-time sponsor for AXIALFEST2017! KLP Hobby representatives attended last year, all the way from China, and are attending again this year! KLP Hobbyhas been established for 9 years with a focus on R/C car models, and is the first AXIAL dealer in China. Since 2009 we have gradually become agents for many major brands. KLP HOBBY is also the founder of CCA (China Crawler Association), organizing and participating in a number of R/C car crawler games held throughout China. We also aim to promote this event through various platforms and media. We welcome all fans and companies interested to get in contact, and to continue to build and promote this area in China. Axial RC Inc. is proud to announce that CKRC Hobbies is returning (since 2014) as a secondary hobby shop to support AXIALFEST2017! CKRC Hobbies is one of the only two hobby shops officially vending at the event. The CKRC Hobbies family have contributed vastly to the physical needs of the AXIALFEST event over the years, and we will again greatly rely on their services. Axial RC Inc. is proud to announce RC4WD as a returning official sponsor for AXIALFEST 2017! In 2005, the business was thriving, stocking nearly 800 parts from companies like Thundertech Racing, JPS, New Era Models, Imex, Defiance Racing, RC Alloy, Vertigo performance and many others. Up until 2006 RC4WD was a one man operation, when business was booming the RC4WD founder employed the help of his friends and family to keep up with the orders. 2006 was a pivotal year, as a college friend of the owners dropped his full time job in effort to help build RC4WD into a force to be reckoned with. Like many companies suffering growing pains, RC4WD and crew rented a small garage unit without amenities such as air conditioning or functioning windows. Working through the California heat in these conditions did not detour the owner from building his dreams. In the summer of 2006 RC4WD reached another milestone as he was seeing a significant shift in the market place. The demand for specialized rock crawling products was emerging, and there appeared to be a lack of interest from some of the manufacturers in filling this demand. Perhaps the owner just had the foresight of what the market was going to do, either way a decision was made. 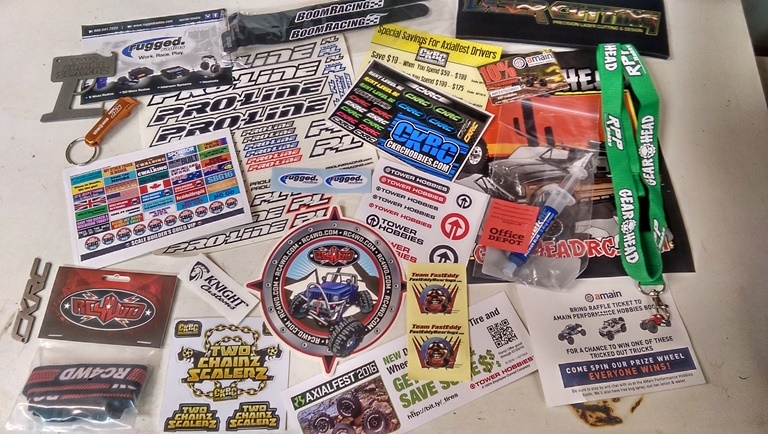 RC4WD scaled back on their distribution of other companies products and began to focus on delivering exactly what the enthusiast community was asking for. The RC4WD manufacturing company was born. This stage was the most difficult, as engineering, manufacturing, sales, and marketing staff had to be hired to make it all work. RC4WD now controls all facets of its products, including engineering, manufacturing, sales, marketing, and customer service. RC4WD now has designers on almost every continent developing the latest and greatest products to suit your RC crawling needs. The last few years have brought about some extremely detailed products catering to the “Scaler” segment of RC rock crawling. It is not uncommon to see an RC vehicle clad with RC4WD products that requires a second look to know if you are looking at a scale model, or at the real thing. Axial RC Inc. is proud to announce Boom Racing as a returning official sponsor for AXIALFEST 2017! Boom Racing’s products are designed with your R/C hop-up needs in mind. With great passion for the R/C hobby, you can be certain that Boom Racing will always have something new for you R/C enthusiasts! Whether you’re looking for some affordable rims, or even a set of durable piggyback shocks, Boom Racing has it all for you at the largest online RC store. Boom Racing’s line of R/C cars and trucks and upgrades continues to expand and will guarantee that you can find great products at great price.